I am a big fan of Mark the graph’s blogs (both his election blog and his currently ‘paused’ economics blog). I have been watching his work to gauge the impact of the ALP’s odd leadership non-contest. There is probably enough data to say something clear now – and what we can say is that it was bad. 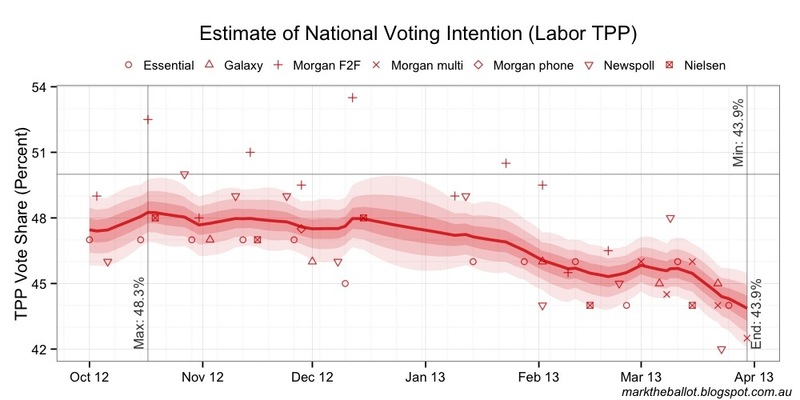 The latest poll aggregation shows an electoral wipeout for the ALP. Mark’s analysis of recent polls suggests the ALP will win only 44% of the two-party-preferred vote. This translates to less than 50 seats for the ALP, and around 100 seats for the conservatives. That’s a thumping defeat (for the ALP) in anyone’s language. I’m not expecting much of Abbott as PM though. I’m imagining a federal version of Ted Ballieu (i.e. cautious, timid and very far from ideological). He’ll be a disappointment. I do expect him to be very pro-mining though. Perhaps they’ll need Turnbull before the end of the first term to guarantee a second term. I agree with Mark the graph and ballot. 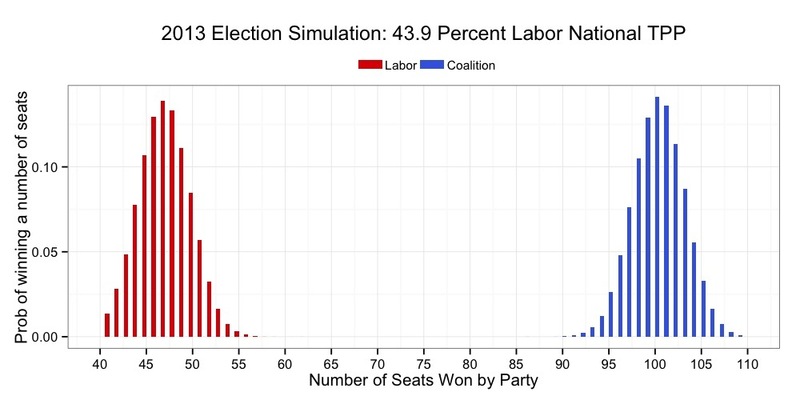 Seems unlikely it will remain this bad for Labor (eg 1975-style landslide), but who knows. Poll Bludger’s “Bludgertrack” says something similar (56.5-43.5 TPP and seats 99-46-5 (not projected)). The Senate will be interesting. A Coalition majority will make it very tempting to make bigger IR changes. Peter Brent at the Mumble blog thinks Workchoices did not cause Howard’s 2007 election loss – it was more-or-less inevitable – so I think they ought to seriously think about going a bit further than they have indicated to date. Wait for May budget. There will be many gifts for many voters. Surplus will be postponed indefinitely. What counts is the 2 months just before the election. All the rest will be forgotten. True. Howard came back from worse, but he had more respect. I don’t think any policy they announce will have much credibility – they are too far gone. Their hope is that they do not have much opposition. They are losing on credibility and because they are divided, but conservatives are not winning. yes :) not uncommon for centre-left. Giulia should learn a bit of a political magic. Just promise the impossible. Over and over again. They will believe you. Why do you describe one of the major political parties as ALP and the other as conservatives? Why not Coalition, or Lib-Nat, to be consistent. Some “framing” going on? it’s just because there are two of them.